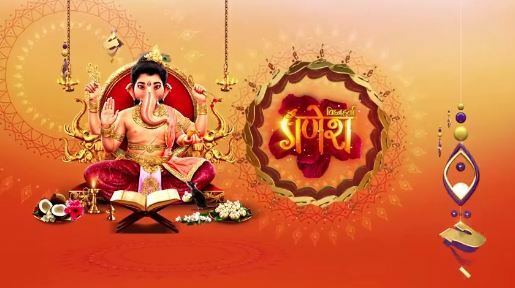 The episode starts with ganesh inside the room with the diya and mushak ji, the doors are locked. Ganesh says mushak ji we have to soon go from this room. outside, durgamasura is with all demons outside the room. the demons try and push the door to open it. inside ganesh sees many rishi’s who are weak and injured, he says who are they all? All the rishi’s see and say ganesh ji! Prabhu you came here. mushak says prabhu, it seems these brahmins have been kidnapped by durgamasura and kept here captive. ganesh says you are right mushak ji. Ganesh says brahman dev, what happened here? the brahmins say prabhu, we are thankful you came to rescue us from here. durgamasura kidnapped us all and put us here because he wanted to stop all brahmains from doing the yagya’s, because we were stopped from doing yagya’s even the gods did not get their strength and what we sacrificed from the yagya! That is why the world would tear apart and everything would not be as it is. Durgamasura has kept us here captive and we have become weak prabhu, he wants to destroy everything. Ganesh says durgamasura even took devi of ved captive, but mushak ji we have to save devi of ved and all these rishi’s from here. mushak says prabhu, durgamasura is at the entrance banging the door of this room. we have to be quick prabhu. Ganesh says I have this diya and we had to use it at the right time, mother’s powers have to be exposed to durgamasura’s lok, once it’s light touches the lok, it will be destroyed and durgamasura will lose everything. ganesh takes all rishi’s and he says I will rescue you, you can all escape from the secret back cave. Ganesh takes the rishi’s and he guides them out from the room towards the secret cave. Mushak ji follows. As they go out, ganesh tells the rishi’s to go through the cave. The rishi’s go and they do pranam to ganesh and thank him for saving them. Ganesh has the dagger sword and he says mushak ji, we have to break the trap around devi ved, from that she will be saved too. Mushak and ganesh go to save devi of ved. While durgamasura and all demons try to break in, durgamasura says I will try to break this door, get away you foolish demons. Durgamasura tries to break the door. there ganesh saves devi of ved and she comes out. Suddenly ved devi appears and durgamasura is shocked and says ved devi, how did you come here? devi of ved gets all her strength back and says durgamasura you will be punished, I have been saved by ganesh ji. Devi of ved uses her powers and she throws a spell of acid on durgamasura’s face. Durgamasura’s eyes burn and he screams in pain. Ganesh comes out of the door and the diya’s light touches durgamasura’s lok, the lok starts to tremor and shake! Everything starts to get destroyed, all demons fall down as rocks and pillars fall on them and they. Ganesh does pranam to devi of ved. Ved devi says prabhu, thank you for saving me. ganesh says ved devi, the knowledge has been restored because of you and all gods have got their strength back. ganesh and devi of ved go back to Kailash. Durgamasura is shocked and angry. Precap: Brahma dev gives the ved book to ganesh and says from today even you shall hold the book of vedam! Because the knowledge shall always stay in your hand.